Tabasco Green Pepper Hot Sauce is one of my favorite sauces. The tabasco sauce has a medium burn and adds the perfect touch of flavor to almost anything. It’s a light green sauce with a watery and thin consistency. After cooking it into my chicken, it lost a little bit of the spice. I prefer the uncooked taste because I love the medium spice to this hot sauce. This sauce doesn’t have a lot of ingredients… it’s basically vinegar and jalapeno pepper. I think Tabasco nailed the perfect mix of these ingredients because the sauce is delicious. 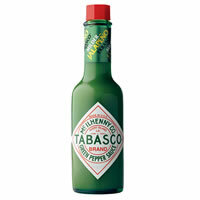 Overall, I really like Tabasco Green Pepper Hot Sauce and would definitely recommend it as one of my favorites. This sauce is a light green color. It is thin with a water consistency. It smells like vinegar and jalapeno pepper. You can definitely smell the spiciness, but I love Jalapeño Pepper, so I like the strong smell. Medium spice level. It’s not too hot to handle, but has a nice kick to it. I love green pepper and Jalapeño, so I was excited to officially try this sauce. It has a really nice flavor with a little bit of a burn, but nothing too spicy. It’s hard pinpointing what I love about this sauce, but the mix of ingredients really creates a delicious tabasco sauce. There aren’t a lot of ingredients in this tobacco sauce. It basically consists of Distilled Vinegar, Jalapeno Pepper, Water, Salt, and Preservatives. 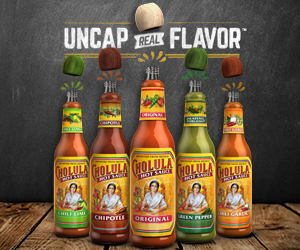 Obviously the Jalapeno Pepper is what brings the spice to the hot sauce, but it also adds a delicious flavor. It must be the Jalapeño that makes me love this sauce. When I added Tabasco Green Pepper Hot Sauce to cooked chicken and allowed it to cook a bit, the sauce lost some of its spice. I have to admit, that was a little disappointing. Overall, I still love the tabasco sauce. It doesn’t taste too much of vinegar or jalapeno, it’s the perfect mix. The 5 oz bottle costs $3.99. That’s a really great price, especially because a little sauce goes a long way.